Mennie’s fiberglass entry doors are proudly installed at the entrances of some of the most prestigious homes in Paris, London, Tokyo, New York, Sydney, Dubai, Seoul, and throughout the world. Why? Mennie’s Fiberglass doors present the same finish as traditional wood doors while offering the homeowner significant energy savings, enhanced security and superior durability versus any other entry door product. As a leading manufacturer of fiberglass entry doors, Mennie’s dedicated team of engineers and designers around the world have been able to produce fiberglass entry doors which combine luxury, classic style, with beauty and strength. Simply put, they are the best quality fiberglass entry doors in the world. Founded in 1996 Mennie group has since grown to become the third largest fiberglass door manufacturer in the world. Our state of the art 500,000 sq ft manufacturing facility can produce ONE MILLION door slabs per year. Significant investments were made in research and development to create the highest quality Fiberglass doors available in the market, correcting the mistakes of Fiberglass door manufacturers before us. Mennie Group produces the strongest, most durable door frame on the market, engineered with Canadian Pine LVL (laminated veneer lumber), the strongest natural construction material available. Significant investments were also made to produce the finest wood grain dyes to cast the Premium Fiberglass door skins. The Mahogany and Oak grain are virtually indistinguishable from real wood doors. The doors are sealed water tight on all four sides with a 100% composite perimeter and are also factory coated to seal out any moisture and ensuring your door will last a lifetime. Maintenance free!! Mennie Groups’ state of the art 500,000 sq ft manufacturing plant can produce 1 million doors slabs per year. Our attention to quality and detail has propelled Mennie Group into the top three Fiberglass door manufacturers in the world. The Mennie Group is the second largest producer of Fiberglass doors in Asia and is one of the top 5 producers in the world. 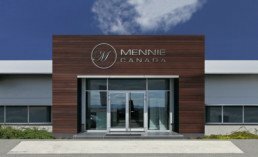 Mennie Canada was founded in 2007 and recently celebrated 10 years in the Canadian market. We are the number one Fiberglass Entry door company in Canada. As a result of our success we are pleased to announce the opening of our new head office and warehouse at 111 Advance Blvd. in Brampton. This facility will triple our existing inventory of door slabs to 35,000. This also allows s to partner with you to warehouse your products and deliver then to you JIT.